Marine boat lift is primarily used to launch or haul small to large-sized boats with excellent efficiency and stability. It can be employed in a variety of situations ranging from small marinas, shipyards to large marinas and commercial yards. 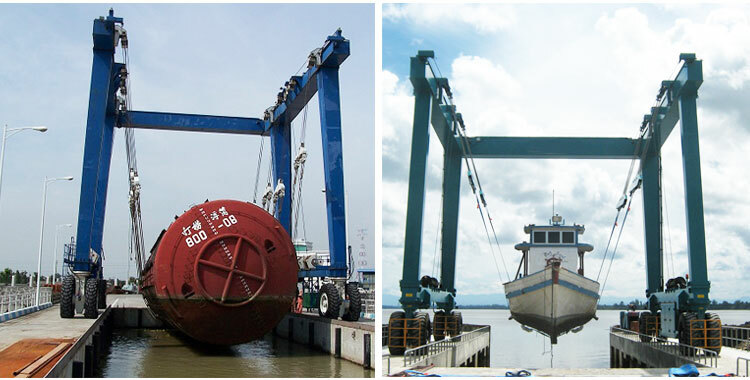 The marine boat lifts are capable of handling a substantial amount of weight, usually going up to 1200 tons. 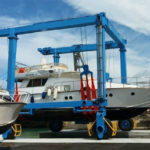 Our marine boat lift crane can be specifically designed and built to suit your vessel configurations, and also provide maximum safety and reliability for your yards. The boat marine travel lift will be equipped with travelling and independent steering system that can suit different working conditions. The steering system offers a variety of options, including fixing axle steering, 90 degree steering, Ackermann steering and so on. It provides excellent alignment of wheels under any condition and also ensures a high performance even in a confined area. The hydraulic steering system can be controlled by means of cylinder or turbine worm. 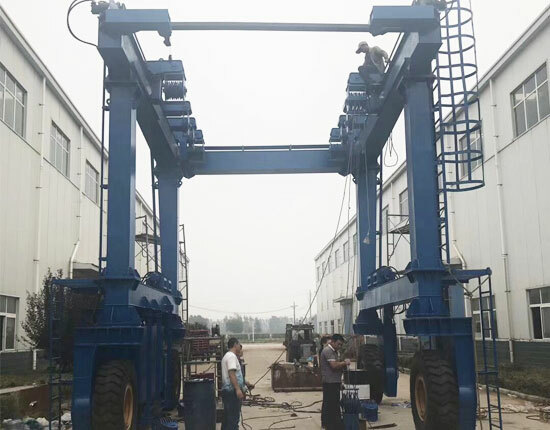 The marine boat lifts hoists mechanism uses load-sensitive hydraulic system, and the whole machine adopts fully hydraulic transmission system. In the application of small tonnage boat handling, we are able to design a cost-effective electric drive system if needed. The control mode of marine boat hoist is available in remote control and cabin control for you to choose from. The marina travel lift can also be outfitted with a weighing system that is used to limit overload and to control the boat aft and forward weight which will be displayed on the remote control. 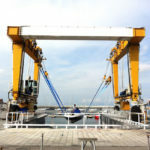 Our marine boat lift crane is made to suit various working situations. 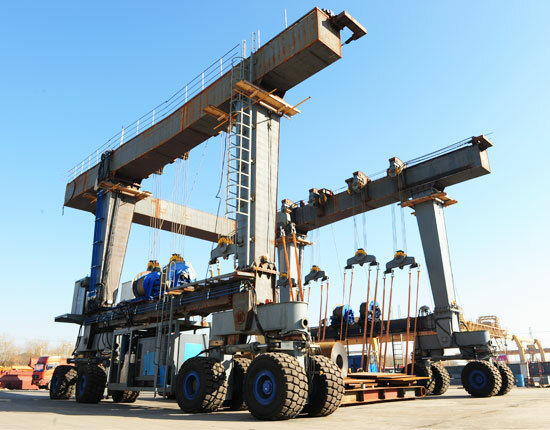 According to the size and weight of ships, it can be classified into small boat lift, medium boat hoist and large boat lift. The small boat hoist is suitable for handling small tonnage ships, such as 20 ton, 50 ton and 100 ton marine travel lift. It is more often found in small marinas, dockside and shipyards. 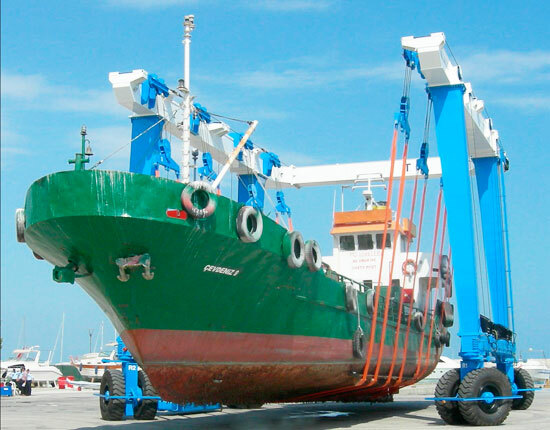 Medium marine lift is capable of hauling a boat going up to 500 tons. 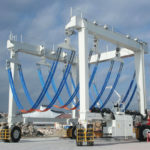 It is ideal for vessel handling in larger marinas and shipyards. 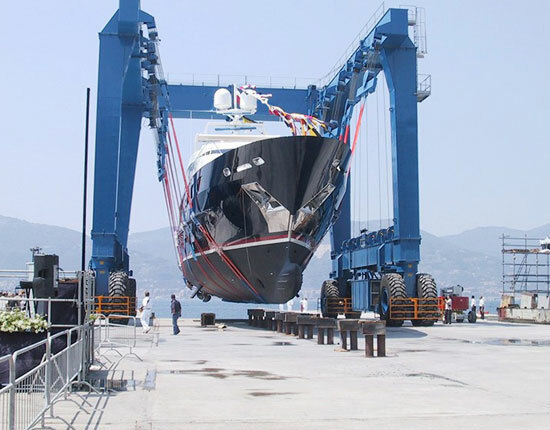 Large boat lifts are extensively used in commercial yards to lift heavy duty vessels, such as super yachts and tugs. It can lift up to 1000 tons and even beyond. 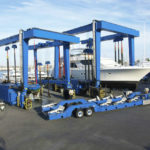 Each marine boat lift can be custom designed and built to meet your special requirements. Looking for reliable boat lift? Contact Ellsen machinery now! 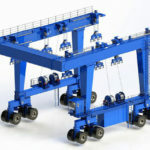 The upper structure of marine boat hoist is a double-gantry U-shaped connecting frame that allows for easy carrying of large-sized ships. In addition to traditional upper cross-beam, the extended beam design is optional to provide additional space. The articulated main and end beam are meant to eliminate structural stress when walking on uneven ground. According to the size and capacity of boat lift, the number of winches on each side can be different but even. The marine boat lift winches can control the lifting points independently and synchronically. The multiple lifting points can be adjusted to raise and lower load synchronically as well as to balance the load equally. Our boat crane lift uses soft but sturdy slings which will cause little damage to the boat surface and structure. The motors are sourced from reputable suppliers in China and abroad. Exactly How to Lift A Boat? The marine boat lift is intended to perform the lifting and transporting work in harbor, dockside and yard. 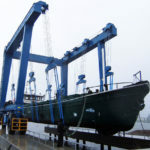 Typically, it can lift or haul a boat in and out of water, transport the boat in the maintenance or repairing yard, or arrange a number of vessels in rows in the yard to increase the utilization of limited yard space. Before commencing the lifting of boat, there are a few checks the operator should conduct in order to ensure a high-level safety. The pre-lift checks include checking engine oil level, fuel level, lifting straps, steering wheels, tires, wire cables and other critical parts to make sure they are in good working conditions. Slings are the units that directly support the body of the boat. They will be positioned underneath the boat and secured with the safety pin. When lifting a boat, all four lifting points will be raised to a point where it is high enough to free from obstacles along the travelling path. While in transporting process, they will be lowered to close the ground level. And after getting in position, the load will come off the slings, and then slings will raise to above ground level. Once the job is done and no more ships are to be handled, the marine boat lift should be parked aside for proper water drainage. The slings should also be well-tied to prevent them from swing in the wind. 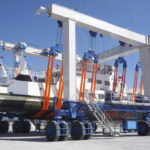 It is of great importance to choose well-experienced and reputable boat lift manufacturers and suppliers for that they will provide quality assurance, service guarantee and reasonable price for clients. Ellsen machinery is recognized as one of leading travel lift suppliers in China, and has been engaged in material handling and vessel handling industry for more than 10 years. Our boat travel lift can handle a variety of vessels ranging from small boats, fishing boats, powerboats, sailboats to large yachts, heavy tugs and super yachts. With our excellent technical team, we are capable of offering custom design to meet your special requirements. Also in the case of malfunction, we provide professional and fast technical support. To get an affordable marine boat lift solution, contact us online today!